FILE – This combination photo shows Saudi Crown Prince Mohammed bin Salman, left, and Turkey's President Recep Tayyip Erdogan prior to their meeting in Jiddah, Saudi Arabia, July, 23, 2017. Ankara is opening the door to a meeting between Turkish President Recep Tayyip Erdogan and Saudi Crown Prince Mohammed bin Salman (MBS), fueling speculation of a possible improvement in ties that were strained by last month's killing of Saudi journalist Jamal Khashoggi at Riyadh's consulate in Istanbul. Erdogan has blamed the death on unnamed elements of the Saudi Kingdom's leadership. 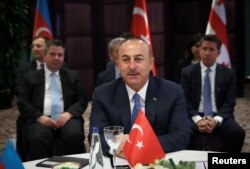 Turkish Foreign Minister Mevlut Cavusoglu claimed the Saudi crown prince requested a meeting with Erdogan on the sidelines of this week's G-20 summit in Buenos Aires. "At this point, there is no reason not to meet the crown prince," Cavusoglu said to reporters Tuesday. Erdogan has not commented on any meeting. FILE - Turkish Foreign Minister Mevlut Cavusoglu speaks during a meeting in Istanbul, Oct. 29, 2018. Erdogan and the Saudi crown prince are widely seen as regional rivals. Analysts claim Erdogan has skillfully maintained pressure on the crown prince over Khashoggi's disappearance. The Turkish president is at the forefront of demanding justice and holding to account all those responsible for the Saudi reporter's death. Some observers suggest Ankara's apparent readiness to meet Salman could be a sign of a change in policy toward Riyadh. "A meeting between Erdogan and the crown prince, which would also produce a good photo opportunity for the latter, but may lead to a number of questions and concerns over the continued investigation and prosecution of the Saudi journalist," columnist Serkan Demirtas of Hurriyet Daily News wrote Wednesday. "A meeting with the prince would not be a good idea if the Turkish side is not planning to enter a new stage in its ties with the Saudi Kingdom in the post-Khashoggi era," Demirtas added. Turkish police are continuing their investigation into Khashoggi's death. This week, two large Saudi-owned residences in the city of Yalova, an hour's drive from Istanbul, were searched. Local media report the owners have close ties to the crown prince. Despite extensive searches over nearly two months, the journalist's body remains missing. Erdogan's dogged pursuit of Khashoggi's killers and repeated insinuations of the crown prince's involvement fueled speculation he was seeking to oust him from power, or at least significantly diminish his power. However, the robust support by U.S. President Donald Trump for the crown prince is seen as dashing such hopes. FILE - Candles, lit by activists protesting the killing of Saudi journalist Jamal Khashoggi, are placed outside Saudi Arabia's consulate, in Istanbul, Oct. 25, 2018. Analysts suggest that with international pressure appearing to ease up on Riyadh and the risk of severe economic repercussions for Ankara, now could be the time for Erdogan to cash in on his strategic advantage. "Justice for Khashoggi is threatening to mutate into economic war, which could upset the lucrative trade, tourism and contracting ties at a time when Turkey needs every penny of Arab money," said analyst Atilla Yesilada of Global Source Partners. "The gains to be made, claiming justice is served, is Turkey has the moral high ground, but economic and political gains are minimal," he added. "Real politics dictates Erdogan just stop short of revealing culpability of bin Salman and settles for political and economic concessions." Any rapprochement by Erdogan with the crown prince would be especially welcomed by Trump, according to observers. 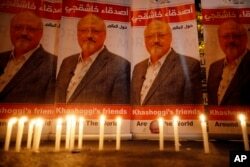 Washington has been forced onto the diplomatic back foot on several occasions by Ankara's release of information regarding the death of Khashoggi. "Trump would owe Erdogan a great deal if Erdogan would just stop this investigation before it reaches MBS," Yesilada said. U.S. National Security Adviser John Bolton said Trump would meet Erdogan at the G-20 Summit. Ankara has a long wish list of demands from Washington on multiple issues. 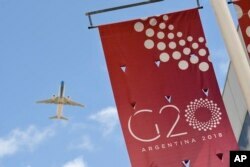 A jet liner flies over the G-20 summit venue at the Costa Salguero Center in Buenos Aires, Argentina, Nov. 28, 2018. "Erdogan is going to follow Donald Trump, he is not going to break relations with Saudi Arabia," said international relations professor Huseyin Bagci of Ankara's Middle East Technical University. "Of course, Saudi Arabia will have to pay something, but I do not know what. However, Tayyip Erdogan will use this situation for economic and political advantages for Turkey." Analysts point out that with the Turkish economy facing recession, Ankara could be looking for financial support from Riyadh, as well as a possible lifting or easing of the Saudi embargo on Turkish ally Qatar. On Monday, Qatari Emir Sheikh Tamim bin Hamad Al-Thani met Erdogan in Istanbul. Up until now, though, the Turkish president has dismissed talks of Saudi concessions as bribery. Erdogan's tough stance over Khashoggi's death has won him rare international plaudits from many of Turkey's western allies, which increasingly have been critical of his rule and the deterioration of human rights in Turkey. Equally, analysts point out that the so-called "Arab Street" is seen as supportive of the Turkish leader's determination to hold Riyadh to account. "Will Erdogan really throw all caution and possibly fat paychecks from Riyadh and political favors from Trump administration to declare all-out war on MBS?" Yesilada asked. "The difficulty in reaching a conclusion in this affair stems from the fact that the three main actors in the drama, namely Messrs. Erdogan, Trump and MBS are not what you and I would call 'rational.'"